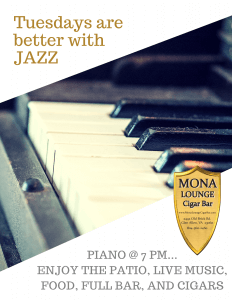 Mona Lounge is a cigar lounge that also offers great food, classy drinks, and live music. We have a state-of-the-art ventilation system that allows you to smoke inside. Everything you’d want all under one roof. 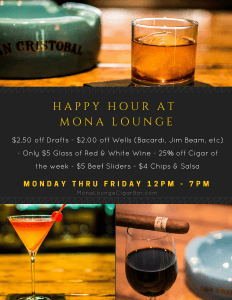 With a walk-in humidor on-site, Mona Lounge offers a vast selection of premium cigars. 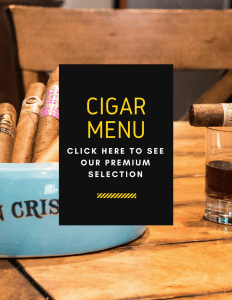 Choose from all your favorite brands, including Padron, Ashton, Davidoff, Montecristo, and many more. We’ll cut it and light it… You smoke it and enjoy it. 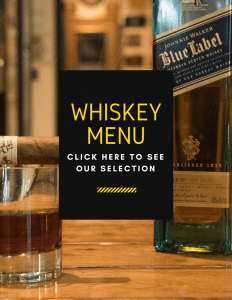 In addition to premium cigars, we offer a full menu of high caliber food choices. 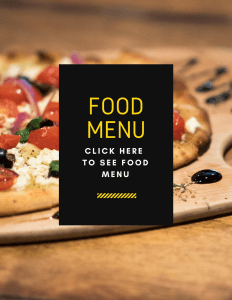 From flatbreads to cheese platters, you can always expect an excellent meal. Fan favorites include our lamb and mozzarella flatbread and our Cuban sandwich. The world needs more cigar bars just like this one. The service from the bartenders could not have possibly been any better. It also happened to be jazz night, so we were treated to a live piano players musical renditions. I love this place. Top Notch Cigar Bar & Lounge. I must say, this is one of the best cigar bars I've been to!!! The ambiance is lively but chill, meaning there was a live jazz band, followed by a DJ playing uptempo music; thus, you could dance or lay in the cut and relax.